If you’ve read our article on buyer personas previously, you would know that the modern customer has changed remarkably. They have an unprecedented amount of information literally at their fingertips. They do not want to be pitched, sold to, manipulated or closed. The majority of your sales team probably can’t even do that even if they tried. It’s not uncommon to find customers knowing more about the product they want to purchase than the company’s own sales people. Customers want to be educated; to get more information over and above what is readily available on Google. Tracking customers as they journey through your sales funnel is no longer enough. 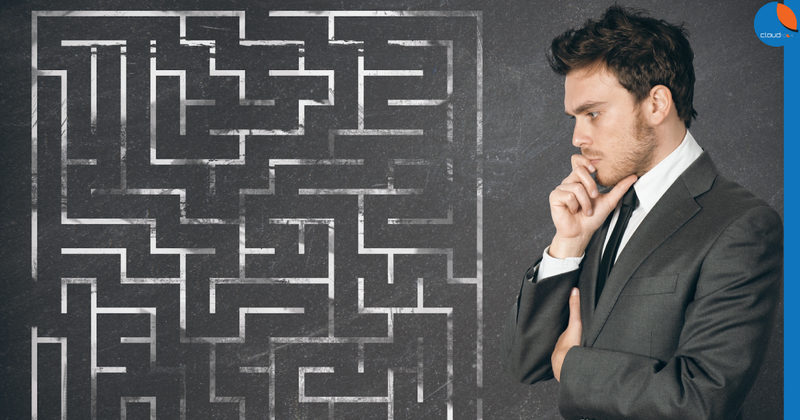 You now need a holistic understanding of the buyer’s journey (aside: the practice of using a sales funnel in itself is surprisingly not very widespread here. Don’t worry if you have never heard of it. We’ll quickly go through it below). The concept of a sales funnel has been around since the late 19th century so it’s not a new concept. It describes the steps prospects take as they journey from strangers to customers. 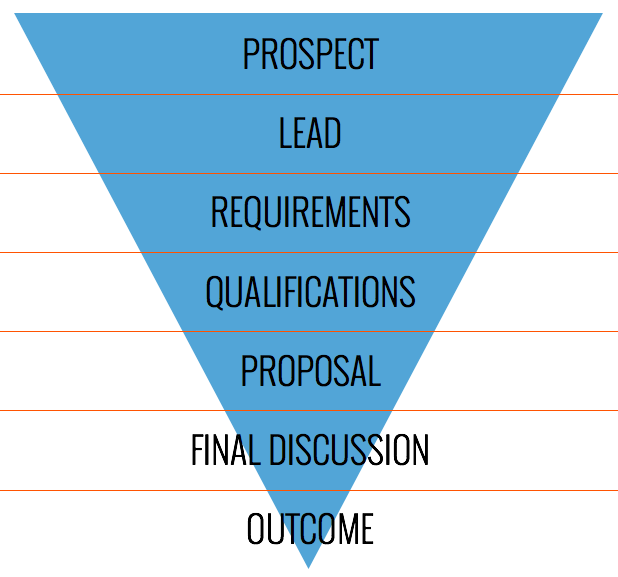 Below is an example of a sales funnel which is similar to what we use at our digital marketing agency (a B2B company). The definition of leads and prospects may differ according to your company or the CRM tool you’re using. 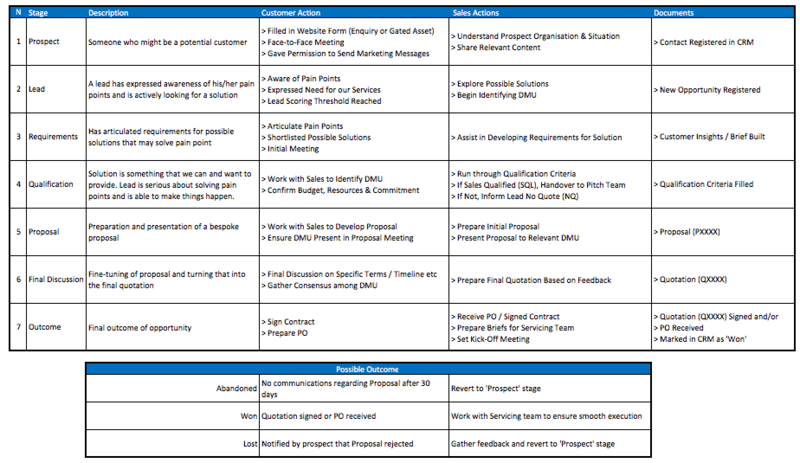 It is a company-focused tool, in that there is an emphasis on your company’s internal processes and how your sales team can work a prospect through the funnel. Once a salesperson gets a new lead, they have only one goal – to get them through the sales funnel. However, it implies that the salesperson has a lot more control over the purchase process. The salesperson is the one providing the lead with the possible solutions and other pertinent information. But research has shown that up to 57% of the sales process today is already completed before a lead contacts a salesperson and that 67% of the purchasing journey is now done digitally (source). Supplier control is a myth. The Buyer’s Journey is the process by which your personas (buyers) go through prior to making an actual purchase. Yes, it sounds almost exactly the same as a sales funnel. But just as the sales funnel is company-centric, the Buyer’s Journey is customer-centric. Semantics? Could be. But it’s hard for me to understand how a company could call itself ‘customer-focused’ if they only had a sales funnel but have not explored their customer’s buying journey. 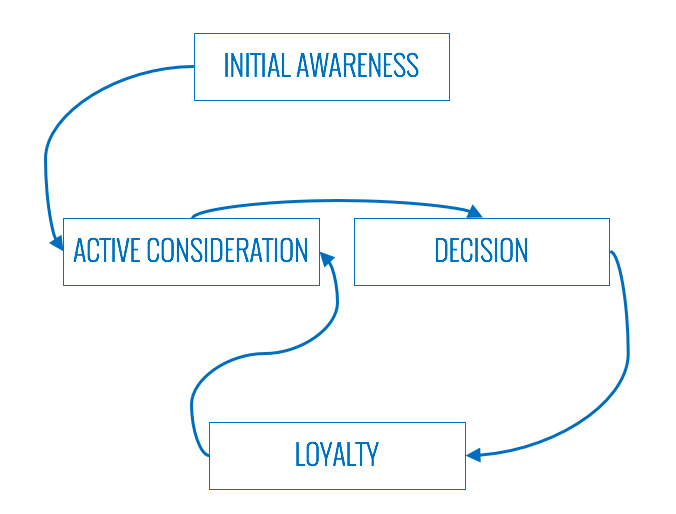 The Buyer’s Journey is a model to keep the buyer’s information needs, behaviour and problems central to everything that your sales and marketing team does. If it looks familiar, it’s because we relied heavily on the work of McKinsey and Hubspot to develop our Buyer’s Journey. The change in how a company treats its customers when they also include a Buyers’ Journey is quite apparent (another aside: while there is a debate on whether the sales funnel is dead or not dead, we believe you can’t really get rid of the sales funnel for now and one major reason is that it’s the tool of choice for most CRM systems.). The insights you get from the paradigm shift can be strategy-altering. In practice, the sales funnel places an emphasis on outbound marketing – you tell your sales team to “Go forth and get us more customers!”. The Buyer’s Journey is all about attracting the right audience at the right time, and ensuring that your organisation has all the answers those buyers are looking for when they are in the midst of researching their problems and possible solutions. In a future article, we will look at the Buyer’s Journey in more detail.